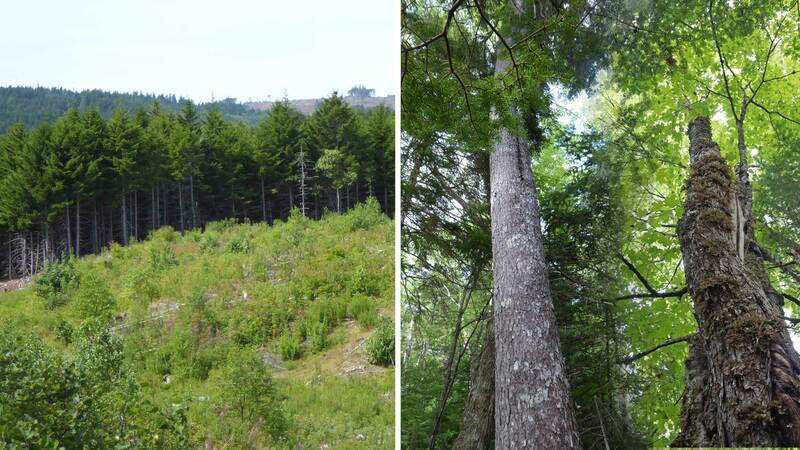 Two approaches to forestry in Nova Scotia. One produces high value wood as well as sequestering carbon, providing habitat for wildlife and peace of mind to visitors. To be more specific: Whats wrong with clearcutting the Acadian Forest in Nova Scotia? Outside of Nova Scotia, apparently, “we spend 80 to 150 years growing a tree in Canada – some of the longest growth rates in the world”… according to Dr. Trevor Stuthridge of FP innovations. I am a bit skeptical about the generality of that statement but regardless, it clearly does not apply to Nova Scotia where we are cutting on rotations of 40-60 years (and even less). There are a lot of other factors that make clearcutting particularly detrimental in this province. This entry was posted in Acadian Forest, clearcuts, Climate Change, Conservation, Ecosystem Services, NSDNR, Selection Harvest, Show Us the Science, Social Values. Bookmark the permalink.